Many of us Mac users forget to update our installed apps to the latest versions, missing out on everything from newly added features, bug fixes, to important security improvements. Sure there are plenty of reasons for forgetting to update applications, whether because we’re too busy to remember, don’t know how to update, or simply don’t get around to launching the App Store on a regular basis, but let’s be honest, this isn’t really a good habit. Fortunately, Apple has thought of an excellent solution, and if you’re in this cohort of forgetful app updaters, consider relying on the Automatic App Update feature built into modern versions of Mac OS instead. When enabled, Automatic Updates is entirely hands off, and Mac applications will update and install themselves in the background without having to meddle around yourself. This is convenient and important, as keeping things up to date is one of the essentials of Mac system maintenance. 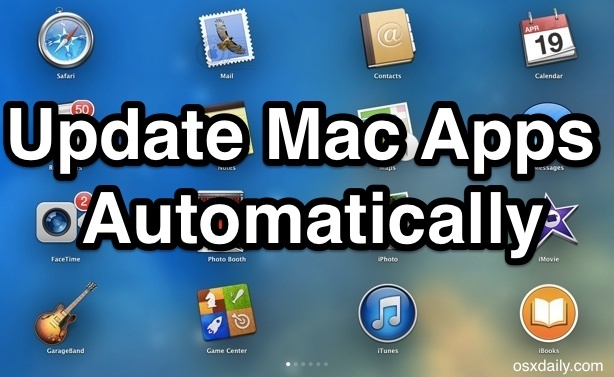 Let’s cover how to be sure this feature is enabled for Mac apps installed through the App Store, as well as important security updates and Mac OS X system software. That’s all there is to it, now all of your Mac apps that have been downloaded from the App Store will update and install themselves automatically without any user involvement. The last step gets you caught up to the latest versions of apps now, something that otherwise won’t happen until the update feature gets around to checking things on it’s own schedule. 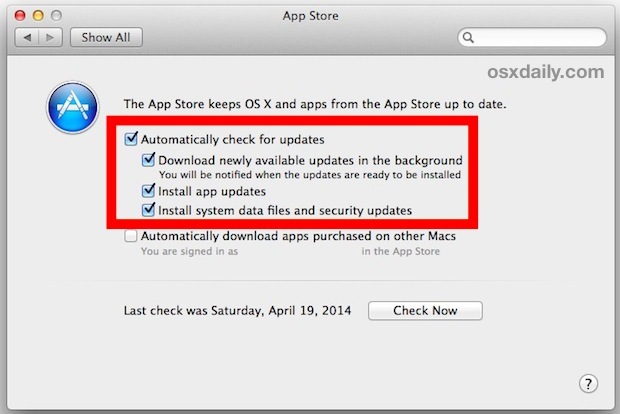 Of course, automatic app updates isn’t for every Mac user. If you’re in a limited bandwidth environment or are intentionally holding onto an old version of an app, you’ll probably want to set the feature to be turned off, but otherwise this is an excellent feature to leave on with most Macs. Stepping away from the Mac, you’ll find that iOS has similar features for the iPhone and iPad, but due to the background activity and power usage it can lead to quicker battery drain. Thus the automatic update feature is typically less useful in the mobile environment and should often be disabled, particularly on the iPhone. My MacBook Pro is running OS X 10.9.2 and has no “Check Now” button on the App Store preference panel. Where you show the “Check Now” button I have a “Show Updates” button. Why the difference? That just means you have updates available that have been detected by the Mac App Store, so that it wants to show you the updates rather than check them. Same thing though, same result if you update all. If you’ve ever had an update change or break something then this is the culprit. The reasons listed are good for some users but not all. I also don’t like my Mac doing anything I have not initiated. A rare time that I disagree with osxdaily. If there was a way to prevent update to the latest version of Keynote (which removes features I absolutely need), then I would do this. This is a recipe for disaster – I could understand checking for updates automatically, but never installing automatically. Too many times in the past have updates broken something or irrevocably screwed data up or conflicted with something else in my workflow. No thanks, not today, thank you kindly. I have put Autoupdate application in Trash by mistake. There is no option under right click on that application in trash “put back” so I do not know where to back this application, in which folder. May you help me, please? The app store link is missing, i tried already search in finder and everywhere. also iphoto is gone. i tried download update but it’s not loading and keep asking for the app to open. Note this is now “Software Update” and these features are in the button.